Docker engine is installed and running. The Skytap VM Agent container is installed and running. Container Host is checked on the Containers tab of the VM Settings page. 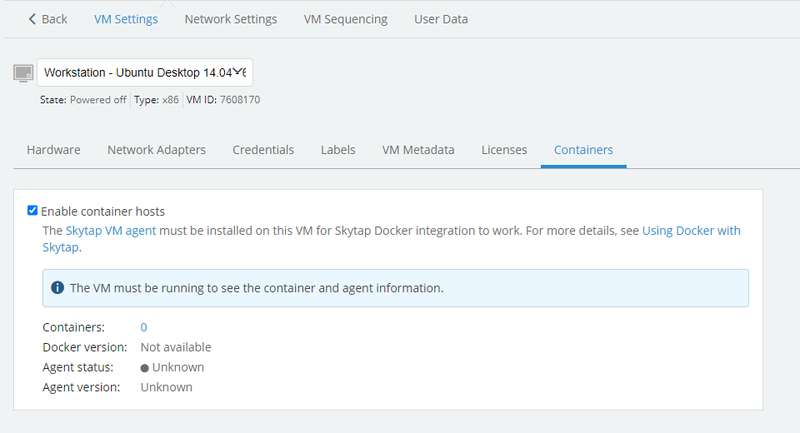 For instructions about configuring a VM to be a container host, see Creating a container host in Skytap. Containers are not supported on Power A particular type of CPU that supports IBM i, AIX, and Linux in Skytap Cloud. VMs. The Skytap VM Agent is a Docker container that enables communication between Docker engine and Skytap. Though the VM Agent is a Docker container, it is not displayed as a running container in Skytap. You can download the VM Agent directly here: https://hub.docker.com/r/skytap/agent/. The VM Agent tab on the VM Settings page displays the status and version of the VM Agent for the selected VM. The VM Agent enables communication between Skytap and the Docker daemon on the VM you designate as the container host. Communication uses the Docker API to query containers, metadata, and the Docker daemon version. Container host – Whether this VM is a container host. Status – The status of the container host. Containers – The number of containers. Docker version – The version of Docker engine installed on this VM.